Combining rustic and industrial, the Driftwood Iron Table and Chair Set stand on sturdy metal legs, with small ball feet. The Round metal and wood table, features an expansive weathered looking top. The two side chairs each have X-designed chair backs and weathered looking seats. The eclectic look of these pieces will add instant charm to your home. Some assembly required. Additional Information Combines rustic and industrial elements. Weathered looking top adds instant charm to each piece. 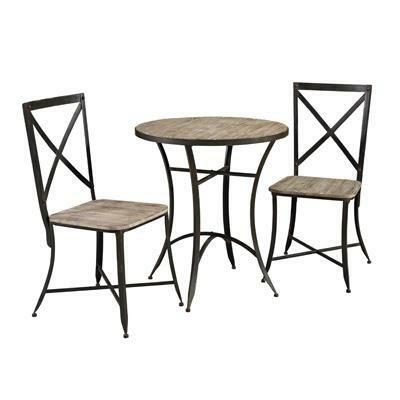 Includes One Round Metal and Metal Table and Two Side Chairs Metal Finish. Some Assembly Required. Detten's Furniture & Flooring has a great selection of furniture from top quality brands such as Ashley, Largo Furniture and more. We are located in Hereford, TX and our knowledgeable staff will be happy to offer you great service. You won't be disappointed! We look forward to seeing you. © 2019 Detten's Furniture & Flooring All Right Reserved.